What in the world can be better than Peanut Butter and Chocolate? Tell me something, can you? Because I'm struggling to come up with much. I don't care how old or young you are - it's hard not to like this awesome North American combination. It is the answer to most problems around here. Filling out taxes becoming, well... taxing? Sit down with a jar of Nutella, a tub of peanut butter and a spoon and the stress just floats away. Writer's block? Spoon + Nutella + Peanut Butter = inspiration. You know what will get me to the gym? A spoon of PB and a hunk of dark chocolate. Shocking fact: Australia barely knows about this combination and hasn't yet embraced it. Whhaaaaaaaaaattt? They don't know about Reeces. They're eerie of peanut butter cookies and are not comfortable using it in baking. I'm slowing doing what I can to turn things around for the greater good, and for the sake of international taste buds. These brownies showcase the romantic combination of peanut butter and chocolate like nothing else. TIP: Don't skip the salt! Salt intensifies the flavour of chocolate, rounds out the richness of brownies and dims down the sweetness so that they are not cloying. A rich dark chocolate batter serves as a base. A good amount of creamy peanut butter gets mixed into a portion of the batter and then swirled right in. Chopped roasted peanuts on top add crunch and an extra punch of peanut flavour. FACT: beat eggs and sugar well until no longer gritty to ensure a picture-perfect shiny thin crust. As hard as it is to resist a warm batch of brownies, just know that they get better with age. As they cool, the flavours will become more pronounced and the texture will become dense and incredibly fudgy. TRICK: Chill brownies in the fridge for about one hour before slicing to get nice straight edges. I'm the type that likes a lightly chilled brownie. I store them in the fridge and let it sit out for just a few minutes before digging in. I'm also pretty sure that these would make the world's best hot fudge sundae, but feel free to try and prove me wrong. It's Peanut Butter and Chocolate time! Preheat your oven to 325°F. 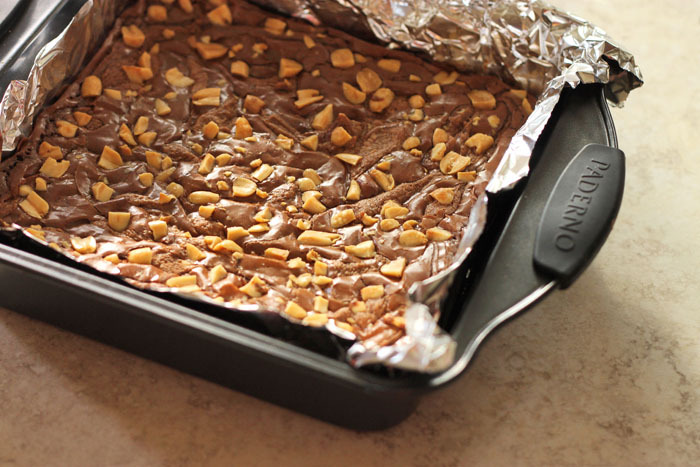 Line an 8x8-inch metal baking pan with foil leaving a 2-inch overhang at each side. Lightly butter the foil. Gently melt together chocolate and butter in the microwave until completely melted, smooth and glossy. Set aside to cool slightly, about 5 minutes. Meanwhile, in a medium bowl, beat eggs with sugar using an electric hand mixer until pale, thick and voluminous, about 1 ½ minutes. Add slightly cooled chocolate mixture, vanilla extract and salt and beat on medium-low speed until evenly blended. Sprinkle flour over the batter and fold it in using a rubber spatula until well combined. In a separate small bowl, stir together peanut butter with about ¼ cup of brownie batter until blended. Pour the remaining brownie batter into prepared pan. Dollop peanut butter mixture around brownie batter in the pan and swirl it in using the blunt end of a knife. Sprinkle peanuts over the brownie batter and bake until the top is shiny and a cake tester inserted into the center of the brownies comes out with a few moist and sticky bits, about 25 minutes. Transfer pan to a wire rack to cool. 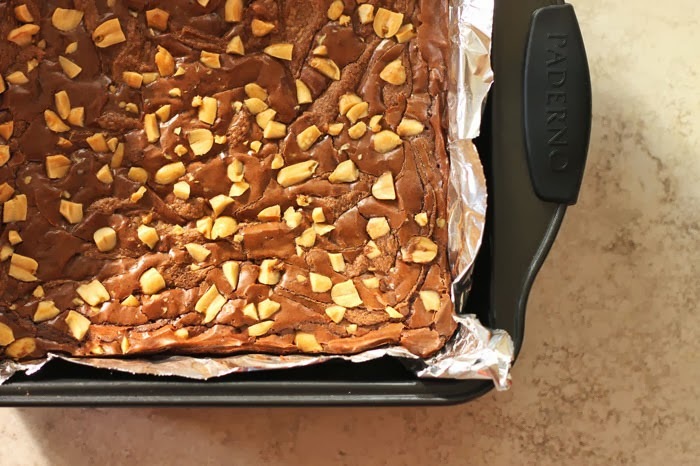 Once cooled, use the overhanging foil to lift brownies out and onto a work surface, slice them into 12 or 16 squares using a hot dry knife and serve! 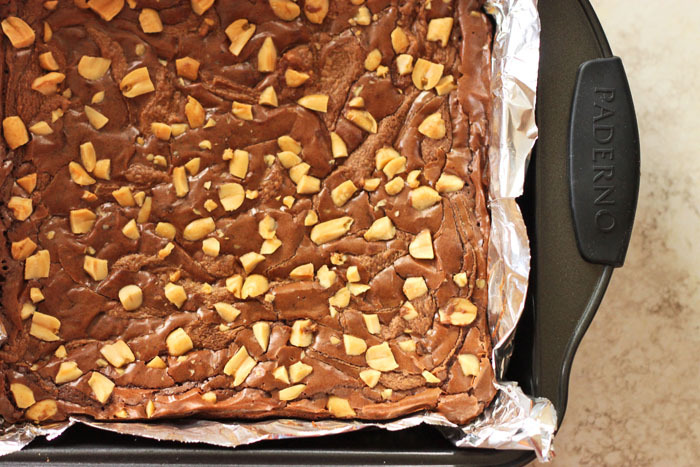 For an even more fudge-like texture, refrigerate for 1 to 2 hours before serving. I like your one-woman crusade to bring the pb and chocolate combination to Oz! Quick question: can I use the ice bath cooling method with this recipe? You absolutely can! (although these will be fudgy regardless, as long as you don't over bake them). Cheers! Cool! Thank you :) Looking forward to trying this! Mmm! These look great! As an Aussie, I apologise for my country's lack of devotion to the Chocolate PB combo! ;) It is a terrible burden to be addicted to these flavours in a land of overpriced imported PB chocolate goodies! (Cadbury, why not???) Happily, what I make in my own kitchen eases that agony. Plus, none of my close relatives seem to object to these baking efforts!